King Caspian has grown old and sad in the ten years since the disappearance of his only son. With time running out, Jill and Eustace embark on a perilous quest to find the Prince and bring back tranquillity to the magical land of Narnia. Journeying to the wild lands of the North, the friends and their companion Puddleglum go through some hair-raising adventures. There are mighty storms to battle and a terrifying encounter with a race of giants who like nothing better than a tasty snack - of human children! Searching deep underground in the grim land of the Earthmen, they finally encounter the wicked Green Lady whose evil plan is to overthrow King Caspian and become Queen of Narnia. Can they stop her? This sixth adventure in 'The Chronicles of Narnia' is a thrilling trip through an enchanted land where heroes must fight the forces of darkness. 2 CDs. 2 hrs 10 mins. 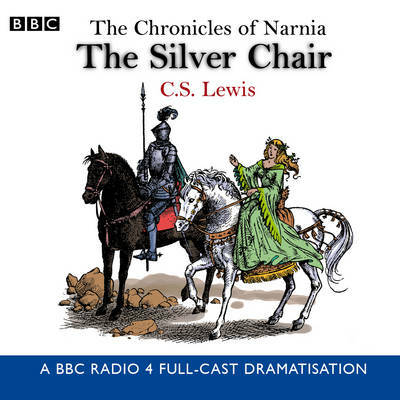 This is one of the better Narnia stories and the cast are well chosen. Bernard Cribbens is especially good as Puddleglum and it's very easy to listen to. Good for children and adults.